This primary color has taken many twist and turns thru history. The Chinese in the 9th century created the blue and white porcelain that we are familiar with. The Chinese porcelain was so beautiful, the Dutch wanted to create their own blue and white porcelain in the 1700s – known as Delft Blue. During the middle ages, cobalt blue was used as a main color in stain glass. The European Renaissance experiments with different shades of blue for depth in their oil painting. Colors like indigo and violet. We are so lucky that history has developed a color with so many shades and options. Not only is any shade of blue a fashion color, it is also widely used in home décor indoors and out. It is used as spa colors mixed with greens and creams. The beachy look is always a favorite with stripes of navy and white on a sofa, pillows, ottomans and rugs. The navy and white theme can be carried through your room with art work and accessories. Blue is also a very sophisticated color used by royals and nobles for century’s. In fact, Queen Elizabeth’s and the Duchess of Cambridge (Catherine) share this as a favorite. Bring blue in your house is an easy choice because there are so many shades to choose from. Blue walls in your dining room with blue upholstered chairs is a great way to freshen up your entertaining space for the holidays. Add a pillow or if you’re in need of a new sofa, think blue. Blue is a perfect timeless and yet modern color for any home. 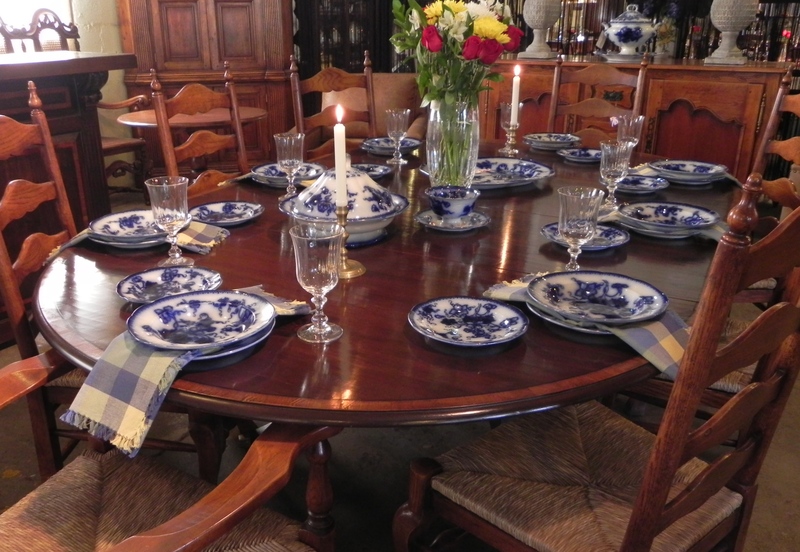 Decorate your dining table with blue & white porcelain. < Previous Something is Missing.